We managed a good plugging session yesterday before the worst of the weather came in and forced us off the rocks - I nearly got washed off a rock into the bargain, but when there are fish around you are naturally going to push it a bit to get at them. Managed a nice bass of about 6lbs on the killer lure that always seems to work for bass - the Maria Chase BW in holographic silver colour (get them here). You need to work it really fast to get it moving correctly, but I have yet to see this innocuous looking lure fail, it really seems to be that good. They are not very expensive either and if you go plugging with 30lb braid on your reel then you can wrench the lures out of most snags anyway. 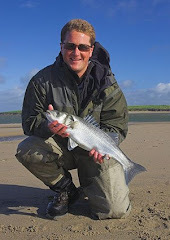 Awesome fish, it hit me about ten yards off my rod tip, I saw it come out the weed and smash into my lure just so hard - yet again it has been confirmed to me just how good the shore fishing in Ireland is and I am going to keep coming back as much as time allows. The bass fishing is about as good as it is anywhere I have ever heard of. Will post some photos when I get home, I am working on a different laptop out here and I can not process my RAW files into a format that I can put up here. Is this unique salmon fishing ?